I blame my mother… She did such a great job of making me aware of being wasteful since she lived through a time when there was nothing, and she was super handy making something out of anything. 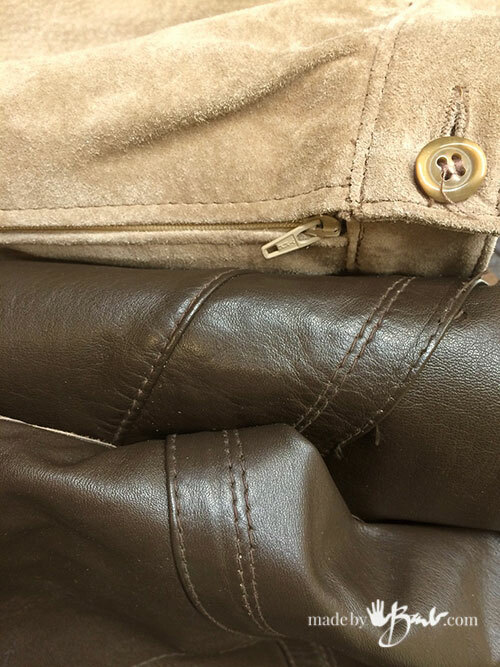 Garment (coat, skirt, pant) leather is great since it is lightweight enough to be sewn with the average sewing machine. The other great fact is that smooth shiny leather is actually suede on the other side. 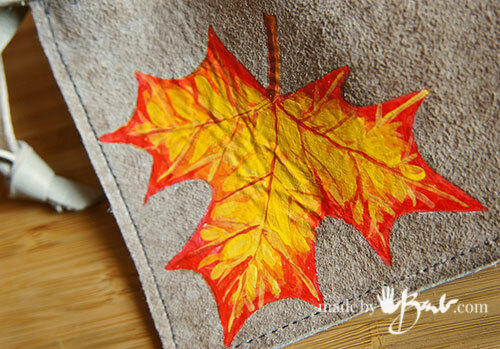 You can peek inside a coat lining and see the backing. 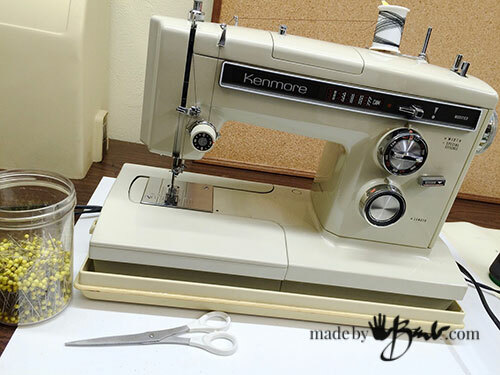 Another fault of mine is that I LOVE my vintage sewing machines! Yes, I said ‘machines’ because I have a bit of a collection… (I need backup ones if one breaks down or needs parts) All metal and reliable, like the muscle cars of the past! They handle the weight of the leather quite well. 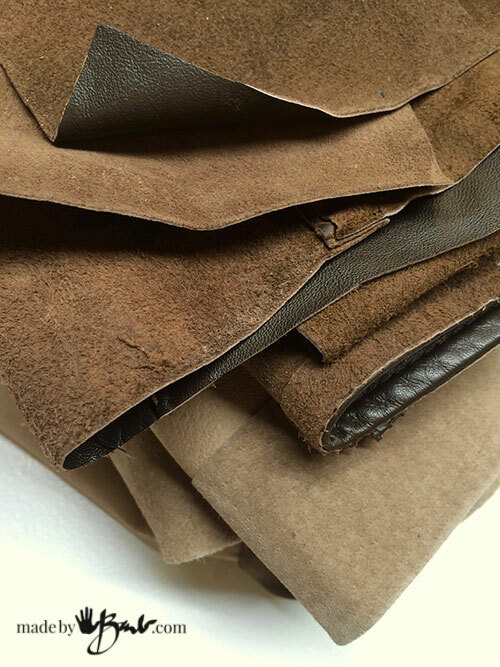 If the leather is quite ‘grippy’ and does not want to slide nicely, there are a few options. I sometimes just put a bit of talcum powder on the seam line with my finger (keep a little dish nearby). Another option is to use a rolling foot/walking foot for the machine. I have heard that some people put some ‘magic-tape’ on the bottom of the presser foot. Make sure that there is not too much pressure on the foot as well. I love our maple leaf as it appears on our flag. 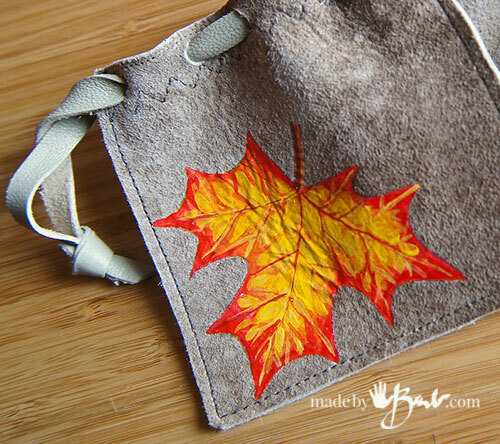 Canada is known for the great fall colours (and maple syrup) thanks to the maple leaves. 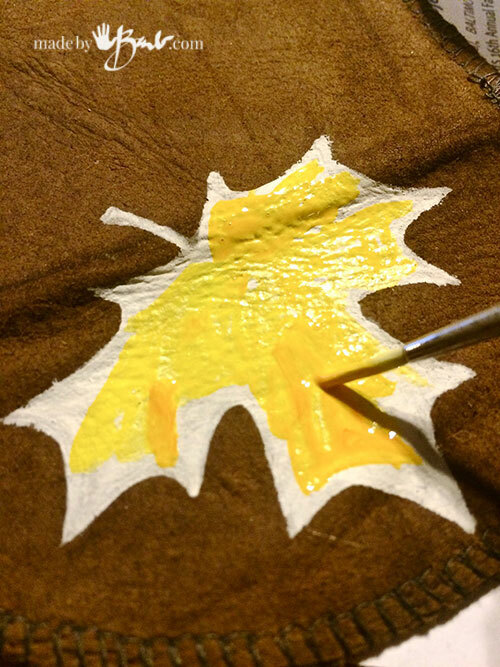 The suede side of the leather works perfectly at adhering the acrylic paint. 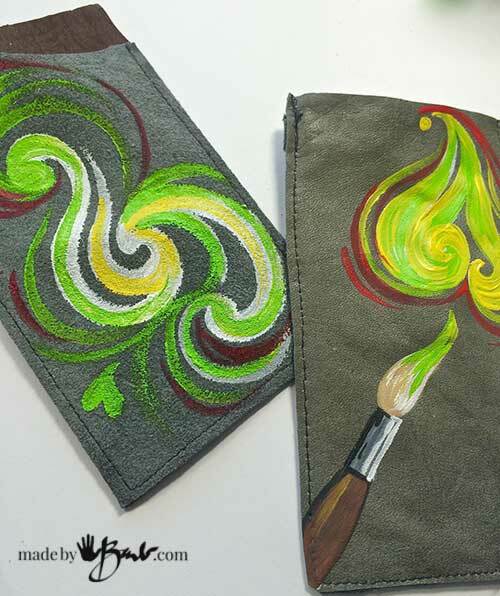 It absorbs into it and will not chip off as it also flexible (artist grade paints are usually better quality). 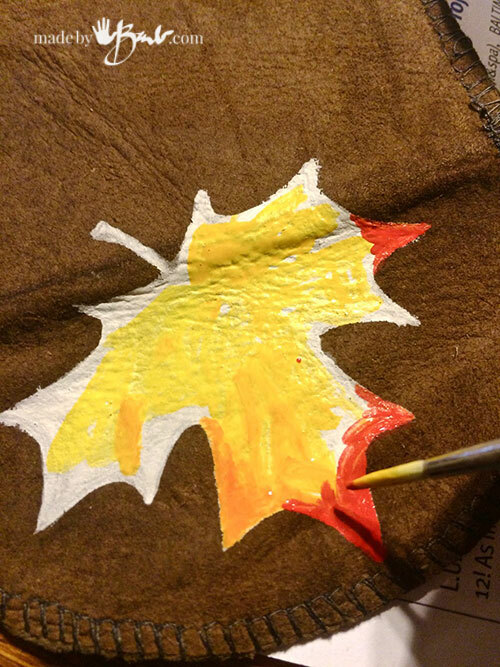 Paint the maple leaf shape in solid white as the background canvas since the leather is dark. 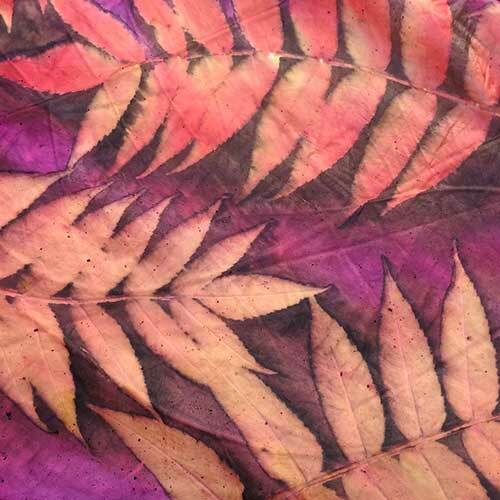 Look at some images of leaves as reference and add yellow to centre sections of the leaves. Add some red around the outside and blend it in. It is quite forgiving as they are never perfect leaves. Take a fine brush and add some veins… tada! 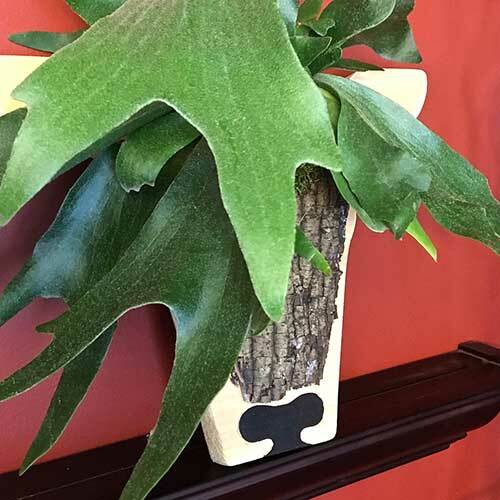 Looks like a leaf! I hate fussing too much so I made simple closures that are rustic as well. 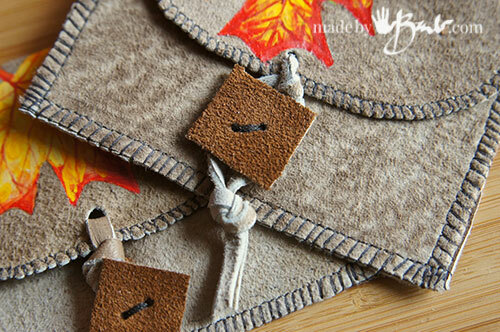 The thicker square of leather is the ‘button’ (or use an old rustic button). As a loop I cut some thin strips and poked a hole and tied a loop. 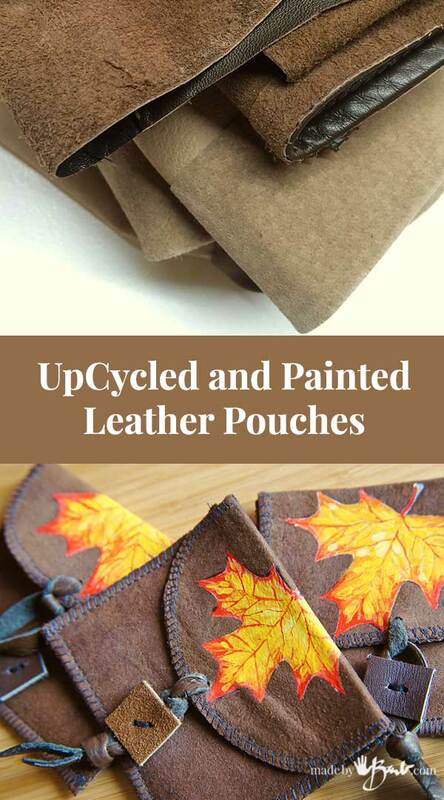 You can also take a hole punch (possibly a paper one if your leather is thin enough) and make a few holes to make a drawstring. 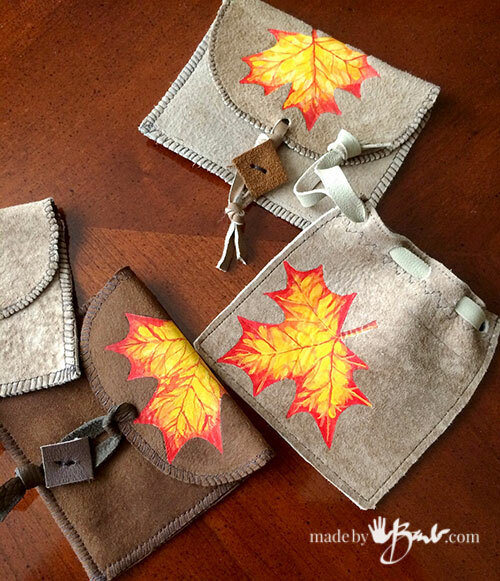 So many options as well with using some stitch patterns if you desire. 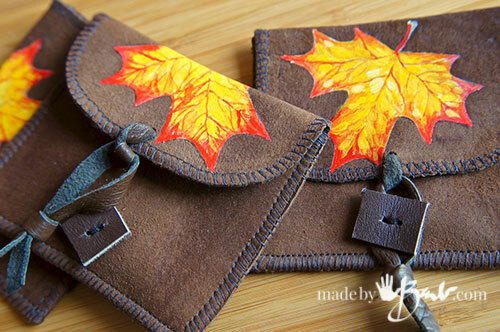 With one garment you could make very very many, which could be great for a fund raiser or kids craft. I bet you have some ideas in your head now… Perhaps some other cases, as for phone or camera? 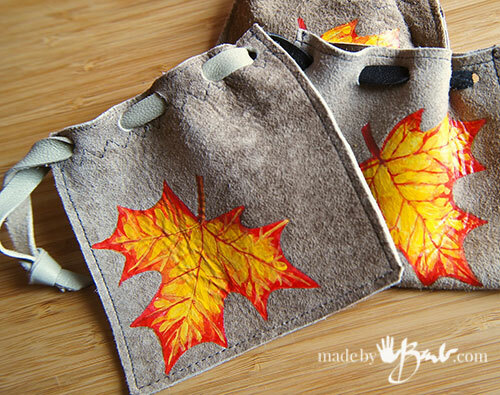 Phone sleeves are another option. 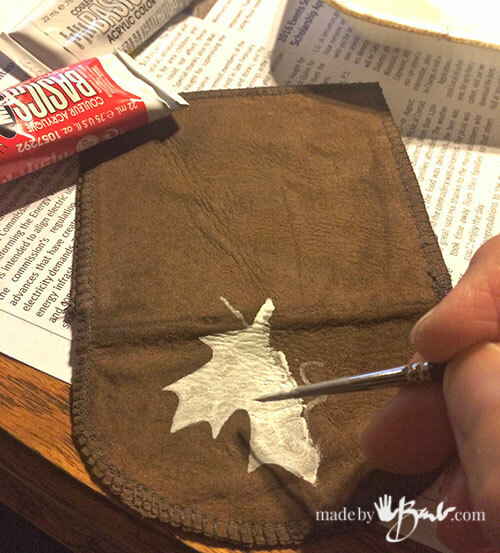 Leather does not fray or need to have finished edges so it is really quick. 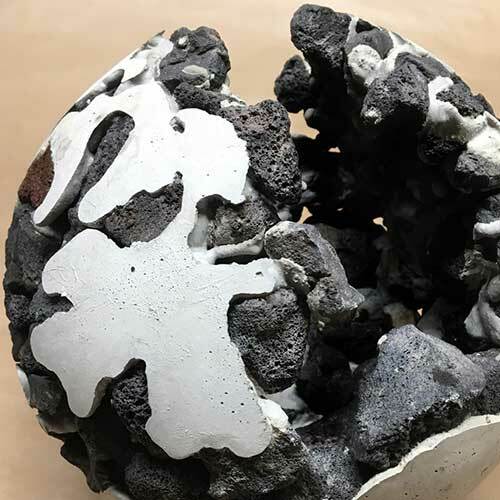 Customize the size and make some fun art.